This is perfect for musicians who want to make quality demo recordings with your iPad or iPod touch. 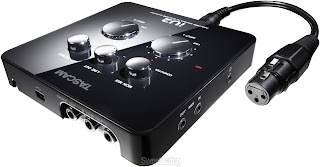 With the included dock connection cable, the Tascam iU2 connects to your iPod or iPad so you can record good quality recordings with Apples studio apps. It can also connect to your Mac or Windows PC as well for USB recording. It has two phantom powered microphone inputs, and inputs to connect a guitar or keyboard. There is also a Midi in and out. This device is amazing for the new way the modern musician records. Of course nothing beats a good pro studio recording, but this is perfect for recording demos, band practice and more. It is the perfect size too. Take it anywhere. It sells for around $150 at Guitar Center. Click the link below for exclusive deals.